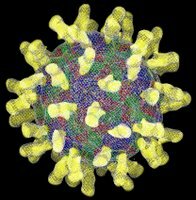 This is it, take a look, a rhinovirus in all its bumpy, canyony, proliferatingly infective glory – nasty little blighter! It arrives by stealth; hanging about in the air after someone has sneezed, or lurking insidiously on door knobs, papers, tables and chairs, following the trail of unwashed hands. It gets into your nose, wrecks your cells, mucks about with their DNA, then expels itself in search of new victims. But that’s not all it does, oh no! To call it ‘just a cold’ is to misunderstand and to minimise entirely the impact it has on every other aspect of your functioning. If all it did were to make us sneeze, what would be the problem really, beyond mere containment? If all you needed were extra tissues, go buy extra tissues and get on with it! This virus, without the benefit of elevated temperature or reduced oxygenation, sneaks into your brain and disengages quantities of valuable IQ until you’re singing ‘Daisy Daisy’ and wondering which way is up. It destroys your will, your incentive, and your capacity to think. It does not, (unlike flu – wherein lie both a differential diagnostic criterion and an unwritten mercy), destroy your sense of urgency or guilt. You’re still driven by the ‘shoulds’ and ‘ought tos’ of your moral imperatives, you still try to meet your deadlines because others are dependent on you. Your head is empty of intellect from the eyebrows up but you don’t quite want to die. That’s what a cold is, an invader of noses and nervous systems, a hijacker of thought and creativity, a sock in the outlet of your cerebral sound system. I’ve run out of tissues so I’m starting on the kitchen towel roll. My nose will display the ravages for some days to come but no one will ask why. Maybe I have Man Flu and maybe men have actually got a better handle on the real nature of the so-called common cold than the rest of us would care to admit. Take a look at this link – Science Musings – and tell me I’m not right!